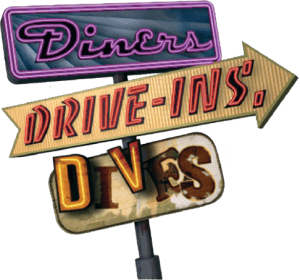 DINERS, DRIVE-INS AND DIVES AT BEACH PUB! 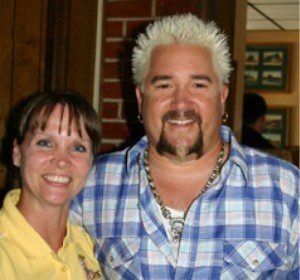 In February 2011, my father, Buddy Barco, received a call from a researcher who worked for the tv show, Diners, Drive Ins, and Dives. My husband and I watched the show all of the time, so I was a little intimidated on that first phone call. When I called, the researcher was as nice as he could be. His name was Jeff Mandell. Jeff asked me a lot of questions about the Pub. I responded that the Pub is a great place, totally relaxed, not at all fancy, but also a place where you weren’t worried that your kids would mess up the place. We offer good food, at a fair price. He seemed to take notes, then wanted a series of photos of the restaurant and a copy of our menu. Over the next several weeks, we had several conversations and emails with Jeff. Finally, he wanted a 30 minute interview over the phone with someone who could make everything on our menu. He wanted to know every detail of the recipes, from the type of flour we use to how long we bake our meatloaf. He said we would hear from him. I think about two weeks passed before he called again with the good news that we had made the show. Out of about 70 local restaurants, only 9 where chosen to be on the show. It was time to get ready! In April, over spring break, the crew came to the Beach Pub. What nice people! They immediately put everyone at ease. Our producer, Mike Morris, had my sister Mary and I serve the customers and he put Dan and Pete in the kitchen. We closed for two days while they filmed. They must have had at least 15 hours of tape to break down for our segment! They wanted to feature three items that they picked off the menu with Guy; however, they wanted to show about ten other items in what they called, “beauty shots”. The three items they picked were oysters rockafellar, baked rockfish with chardonnay cream sauce, and fish hash. The other items that they wanted to highlight included our clam fritters, fish and chips, clams Barco, shrimp cakes, fish tacos, rockfish salad, stuffed flounder and our 12 ounce Black & Bleu Pub Burger. Guy Fieri came at the end of the second day of shooting. He did his bit in the kitchen with Dan and Pete, then came out to talk to our customers. He even went out of his way to compliment my daughter, Hope, on her artwork on the wall. 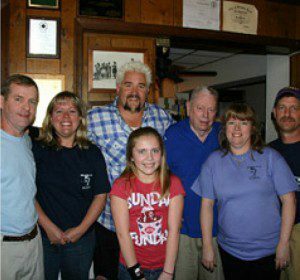 Guy Fieri was very gracious and charming and we are thrilled that he came to the Beach Pub!